This section describes the TICS Visual Studio Roslyn Add-in. This add-in supports Visual Studio 2015 and later versions. 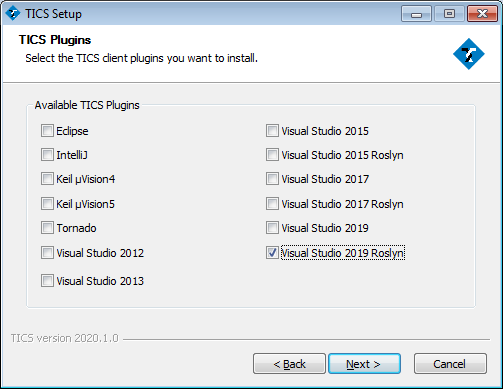 The Visual Studio Roslyn Add-in can most easily be installed through the TICS installer. 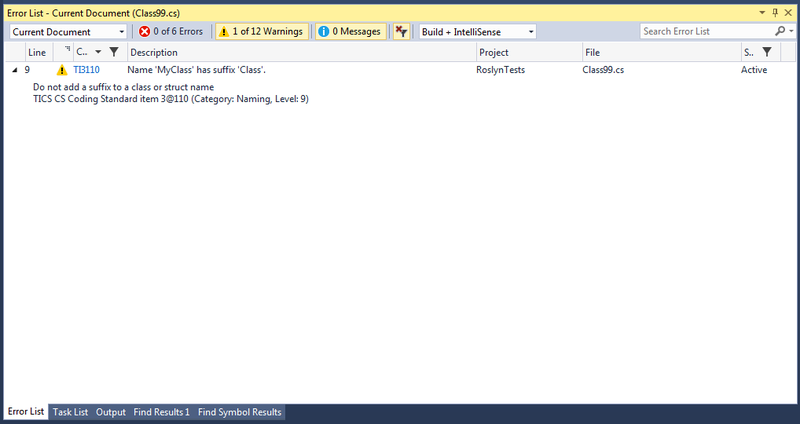 Simply check the Roslyn item in the TICS Add-ins step. The TICS Visual Studio Roslyn Add-in provides analyzers that analyze solutions for coding standard violations. These violations are presented in the form of "squiggly lines", as well as errors that appear in the error list. An example of a "squiggly line", indicating a violation. The error list can be enabled through the View menu. It shows all violations in a project, solution, or document. The error list, showing a list of violations. Each violation can be unfolded by clicking the icon in the left-most column. This provides more information about the violation, including its ID, category and level. Clicking the code opens a web page with additional information about the rule. A detailed view of a violation. 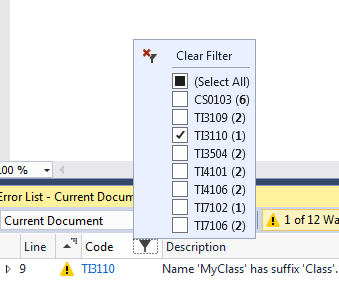 Violations in the error list can be filtered using the icon. These filters are not permanent. Rules can be permanently disabled through TICS. This can most easily be achieved through the TICS configuration tool, which is described under the Visual Studio section. The TICS Configuration Tool can be accessed through the Visual Studio add-in, but is also available as a separate application. A filter being applied on the Code of the violation. 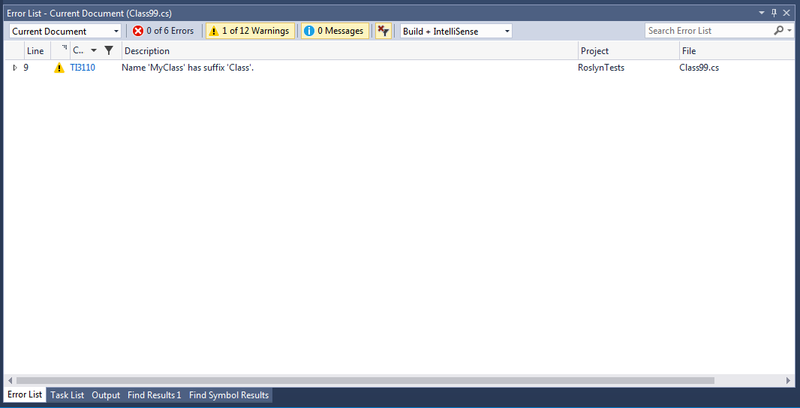 The Roslyn add-in can be disabled through the Extensions and Updates dialog under the Tool menu. Once disabled, violations will no longer be shown in Visual Studio. The Extensions and Updates dialog, showing an installation of the Roslyn add-in. Under normal circumstances, the add-in retrieves the latest version of the rules from the TICS installation. This means manual updates are not necessary.